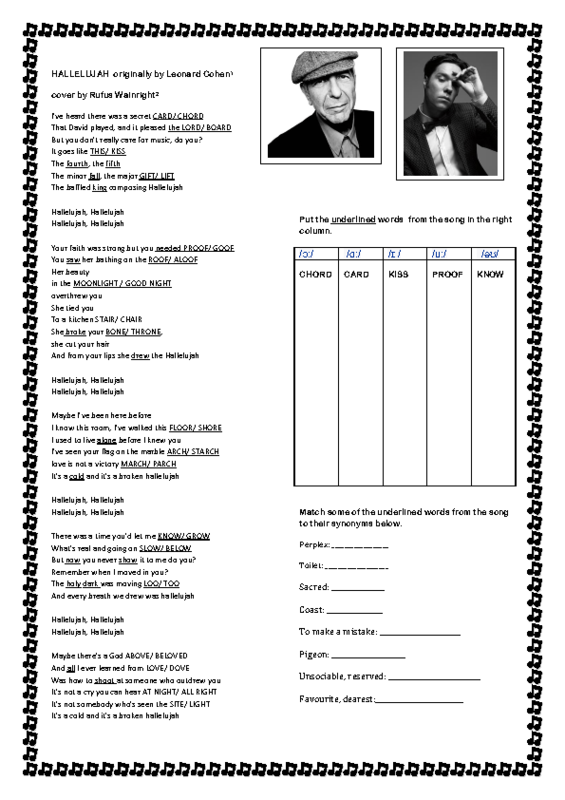 This worksheet is great to work on minimal pairs and to practise the sounds /ɔː/	/ɑː/	/ɪ /	/uː/	and /əʊ/. 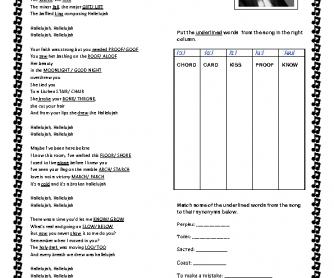 It also includes a short matching synonym activity for the most difficult words. "Hallelujah" is a song written by Canadian singer-songwriter Leonard Cohen, originally released on his album Various Positions (1984). Achieving little initial success, the song found greater popular acclaim through a cover by John Cale, which inspired a cover by Jeff Buckley. Buckley's version is the most enduringly popular and critically acclaimed cover of the song to date. Following its increased popularity after being featured in the film Shrek, many cover versions have been performed by many and various singers, both in recordings and in concert, with over 300 versions known. The song has been used in film and television soundtracks and televised talent contests. My favourite version is the one by Alexandra Burke.